Picross 3D: Round 2 known in Japan as Rittai Picross 2 is a Japanese puzzle video game developed by HAL Laboratory for the Nintendo 3DS. 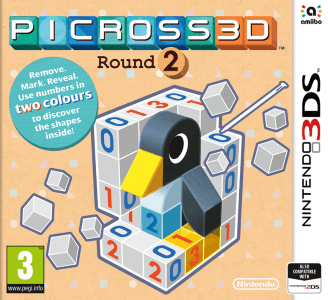 It is the sequel to the 2009 Nintendo DS game, Picross 3D. Picross 3D: Round 2 works very well on Citra. Apart from some FPS dips (probably mostly just shader cache generation) the only issue seems to be missing graphics on the lower screen in the level selection (which makes it hard to actually choose a level, but just randomly clicking around will get you into some level and then it’s nicely playable).